The best way to build your inventory of tools is to buy a home. 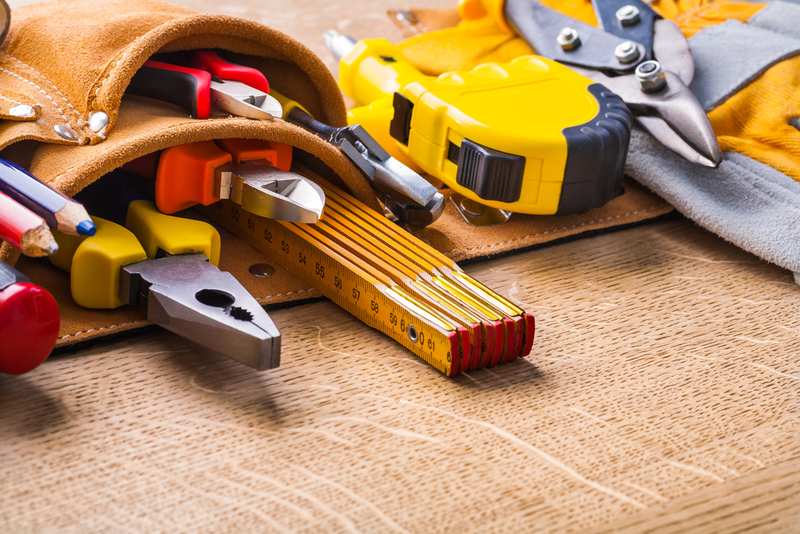 How do you know what tools you’ll need in everyday home maintenance? Today, we’ll take a look at essential around-the-house tools for tackling basic maintenance and home improvement projects. Philips screwdriver. It's a common denominator of almost any toolbox, the Philips (or X-shaped) screwdriver is the master assembler for almost any project. Flathead screwdriver. Also known as the “straight screwdriver.” Having the correct size flathead will also make a difference in your handy projects (think small, medium, large). Two Tape measures. Why two? Well, one is always hiding, or out of reach, or lost, or grew legs and simply walked off. You’ll want two tape measures, just to be safe. Level. Never hang a picture without one. Utility knife. From opening moving boxes to trimming edges of carpet, the utility knife will make your life much easier. Hammer. The crown jewel of all tools! Your best quality hammers will be long and lightweight. Putty knife. Spread putty, paste or spackle. Scrape dry glues and paints. Equip yourself with a 1 1/2 inch (measured by the blade length) for scraping and a 5-6 inch for spreading. Assorted pliers. Two rank in the must-have category: needle nose and channel locks. Think of the needle nose plier as the household version of tweezers: pulling stuff out of small spaces (along with an array of other uses). The channel locks are multi-use pliers that expand and contract for nearly any type of job. Wire stripper. Most helpful in making electrical connections, this tool has a blade for cutting wire to the appropriate length and several notches for scoring the insulation around wires of varying sizes, which can then be pulled off. Allen key (aka Hex key tool). Any assemble-it-yourself furniture will require an Allen key. Hexagonal sockets and multiple key sockets can be purchased separately, or you can find a handy tool with all shapes and sizes in one. Power drill. Save your hand and wrists from turning screw after screw. Invest in a power drill. It adapts to drill bits to bore holes, along with every kind of screw-head bit, making larger projects go faster (and with less elbow grease). Tip: stop the drill when the fastener is tight so that you don't strip the screw head. And invest in a good model; this isn't a tool to buy on-the-cheap. Electrical cord. Think rugged, well-insulated and appropriate for indoor-outdoor use (i.e. big orange cord). It will help extend your “reach” in many ways. C-clamp. This tool holds pieces of wood, metal or plastic together when you need to glue, file or saw them. Make sure to use a thin shim between the clamp and the object you're working on in order to prevent the clamp from marring the surface. Flashlight. Maglites are a favorite, simply for their durability. Store your flashlight where you can find it easily in a pinch. Ladder. Explore some of the metal foldable ladders that are out now. They are easy to store and easy to use. Duct tape. That is all. Quality paint brush. Don't buy cheap ones. You'll want a brush that has high-end bristles. And make sure to take good care of your brush. Thoroughly wash it immediately after use. Music. Never go without good tunes on a home maintenance or home improvement job. It makes every task and chore just a little bit easier and a smidge faster. Have questions? I'm always here for you: (512) 694-9769 or Mike@MikeFreemanProperties.com.